Greece had 12 major gods, the "Twelve Olympians"; 11 important secondary gods; and hundreds of minor gods. An idol is an object worshipped as a god or as a representation of a god. The Old Testament associates idol worship or idolatry with falsehood, vanity, horror, terror, shame and obscenity. The Bible throughout, insists on allegiance to one God (monotheism) called in Hebrew "Yahweh", often translated "the LORD". It teaches that the first humans believed in one God (Genesis 3) who was repeatedly forgotten and later remembered. One remembrance occurred before Noah's Flood (Genesis 4:26); another by Moses (Exodus 3); another by Jesus (John 17:25-26). Critics, however, claim monotheism first occurred when Pharoah Akhenaten (1351-1334) replaced Egypt's gods with sun-worship. Wikipedia says: "The earliest putative reference to Yahweh in the historical record occurs in a list of Bedouin tribes of the Transjordan made by Amenhotep III (c.1391-1353 BC) in the temple of Amon at Soleb." Prior to Moses the custodians of God's name may have been the Midianites of NW Arabia — Wikipedia says: "The 'Kenite hypothesis' supposes that the Hebrews adopted the cult of Yahweh from the Midianites via the Kenites." Archaeology thus indicates that Yahweh-worship is more ancient than Akhenaten. Furthermore, Akhenaten's so-called "monotheism" was Sun-worship whereas the Bible regards the Sun as God's creation (Psalm 8:3; 74:16; 136:7-9) and its worship idolatry! Amenhotep III and Rameses II … started to believe their own propaganda. In Nubia … both were worshipped as living gods. • The Nile River turned to blood invalidated Khnum, guardian of the Nile. • The darkness disconfirmed the Sun gods Re and Horus. • The frog plague disconfirmed Hekhet, the frog-headed goddess. • The cattle plague disconfirmed Hathor a goddess depicted as a cow. • The hail storm disconfirmed sky goddess Nueth, and Seth protector of crops. • Death of the first-born disconfirmed Osiris (giver of life). While scientists have unearthed a few examples of bovine idols, they have never found a calf that predates the Exodus, which scholars think took place between 1500 and 1200 BC. Last week, though, a team of Harvard archaeologists announced they had done just that. After Joshua died the Israelites forgot Yahweh and "worshiped the Baals". (Judges 2:10, 11; 3:7; 10:6-7) Israel's history became a chronicle of idolatry, national decline, repentance, and renewed idolatry. The books of Samuel, Kings, and Chronicles reveal this destructive pattern. Confirming the Bible that Israel fused Yahweh-worship with Canaanite worship is an 8th century BCE ostracon discovered in Sinai in 1975 which says: "I have blessed you by YHWH our guardian and His Asherah". A Middle Eastern war god known from the Bible and confirmed by the Ras Shamra [Ugarit] texts discovered in 1929 in Syria. These mention Baal as Lord of the Earth, depict him wearing a horned helmet, and associate him with the sun and stars. A Babylonia deity taken over from Assyria. 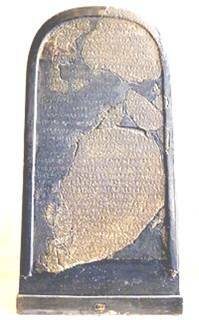 The black, basalt "Moabite Stone" erected by King Mesha, and discovered in 1868, has 34 lines of text. The text portrays Chemosh as commander and attributes victory to him. Jeremiah predicted Moab would be destroyed and become "ashamed of Chemosh." (48:13) This implied the demise of Chemosh worship and came true. Many Babylonia deities were identified with planets — Marduk with Jupiter, Ninurta with Saturn, Ishtar with Venus. Canaanites worshipped the Sun as "Shapash", the Egyptians as "Horus", "Aten" and "Ra". Egyptians honored the Moon under the name "Thoth", Babylonians as "Sin", Greeks as "Selene", "Hecate" and "Artemis", and Romans as "Luna" and "Diana". Diana was also the goddess of the hunt and used a moon crescent for a bow and moonbeams for arrows. Wikipedia under "Sun Deities" lists about 100, and under "Moon Deities" 80. …the great goddess of the Ionian Greeks is shown flanked by animals, bedecked with jewels and images, wearing a tall hat and with multiple breast-like appendages. In Ephesus the Temple of Artemis was one of the "Seven Wonders of the World" and annual festivals attracted 200,000 visitors. 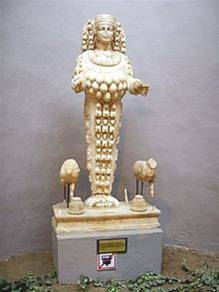 Small marble statues of Artemis dating to the 1st century support the Bible's suggestion of statues being a major industry. Artemis was abandoned after an earthquake destroyed her Temple in 262 CE. In Athens Paul observed an altar to an "unknown god". (Acts 17:23) This gets support from Greek geographer Pausanias (110-180 CE) who mentions an "unknown god" in his book for tourists titled Description of Greece. Apostle John warns against "antichrists" who left Christianity or Christian influence (I John 2:18-19; 4:3) and he says: "Little children, keep yourselves from idols." (5:21) It is idolatry to believe leaders who deny Jesus' authority and try to displace Him. Examples would include Hitler, Mussolini, Stalin, many atheists, and many religious leaders. The lesson here is that the biblical teaching that the whole world is deceived (Revelation 12:9; John 16:2) is valid. Millions of idol worshippers were so convinced that they killed or died for their idols until they were replaced by later idols whose devotees also killed or died for them. Idols today often come in human form supported by ideologies like Nazism, Communism, Islamism or racism, and followers again do everything their idols demand, including evils that the New Testament says "Don't do". (Revelation 21:8) What precautions have YOU taken which all the idolaters did not take so that YOU are different and not deceived?